Scores of youngsters showed up at the Lake Worth Bike Rodeo held May 30. 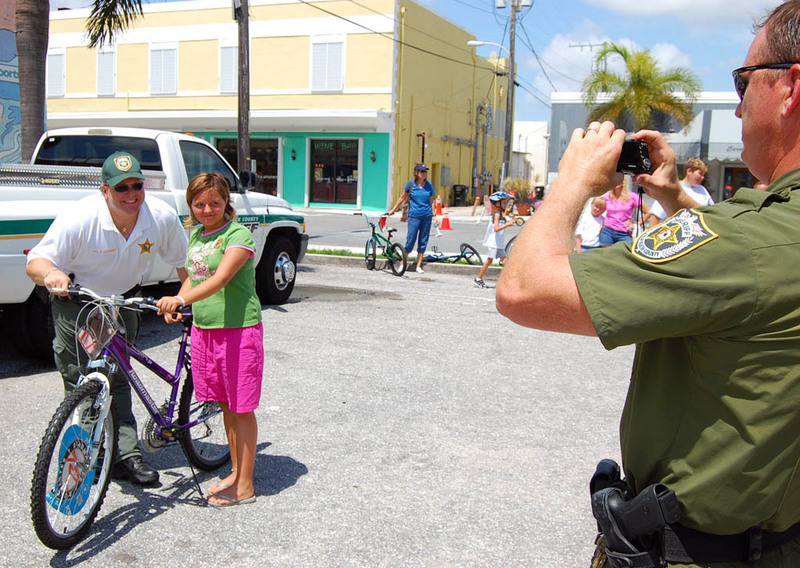 The event was sponsored by the Lake Worth Community Redevelopment Agency and the Palm Beach County Sheriff’s Office. 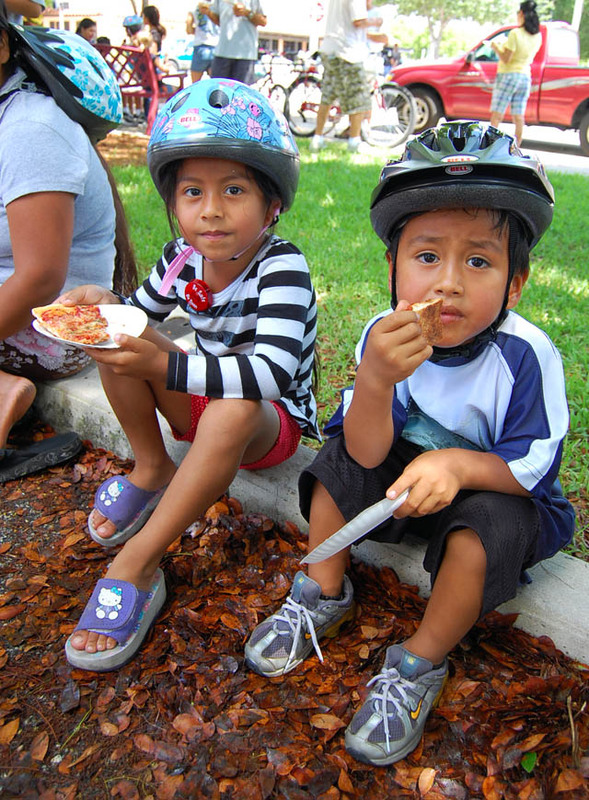 Youngsters who didn’t bring a bike could use loaner bikes. 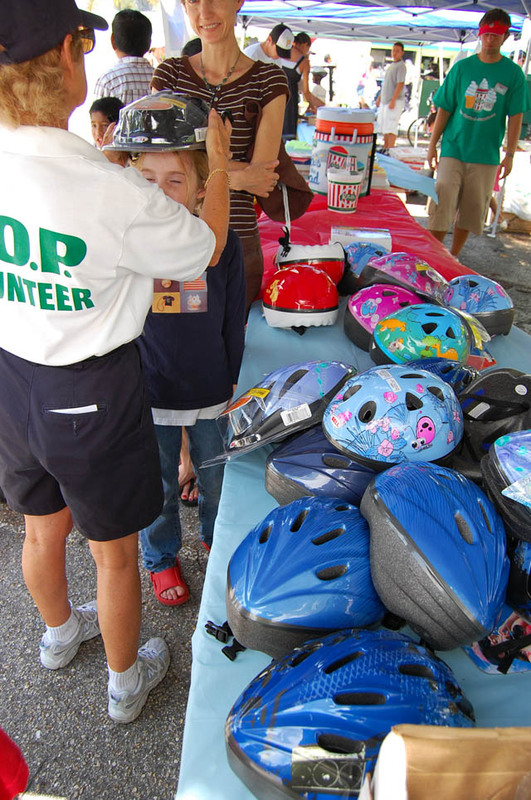 The PBSO gave away Bell helmets to everyone who needed one. 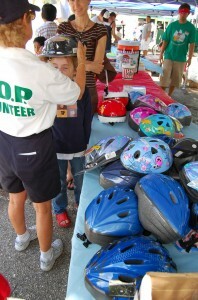 The volunteers helped the children (and a few adults) pick out the right size helmet, fitted it for them and explained how to wear it safely. Now it was time to hit the safety course. Check out the little girl in the video. When she sees STOP, she’s gonna STOP until it says GO. Unfortunately, stop signs aren’t traffic signals. They don’t change. Cyclists in Florida, like in many states, have the option of signalling a right turn by extending their right arm instead of doing that funky left-arm-bent-at-the-elbow-and-pointing-to-the-sky thing, by the way. The volunteers had a challenge teaching signaling to kids who barely knew their left from their right and who, in some cases, didn’t speak English. If I had been setting up the course, I’d have stationed helpers about 20 feet in advance of the stops and turns so the riders could have gotten the concept of signaling BEFORE you stopped or turned. Taking your hands off the bars to signal when you’ve slowed to wobble speed is NOT a good idea. I always signal turns, but I rarely signal stopping or slowing, particularly at a stop sign or traffic signal. It says STOP. What does someone following me think I’m going to do? The high point of the morning for many youngsters was free pizza and a chance to win one of six bicycles that were raffled off. If was fun watching the kids clutching their raffle tickets and following along as a sheriff’s deputy read off the winning numbers in English and Spanish. Isn’t this just the state’s way of getting little kids hooked on the lottery early? Previous PostPrevious Bikes and Music: A Recipe for Pain?